The first few minutes of the movie do really well to pull you in. There’s a nod to the filmy Punjab as we start from lush fields, but we soon realize that these are not the same fields where a Raj would be waiting, arms extended, for his Simran. From setting things up for Mary Jane (Alia, easily the best performance here), to a quick introductory montage of other important players set to the tunes of Tommy’s singing, the first few minutes had me interested. The last half hour or so, where all the strings start showing just how they’re tied together, is another period in the movie that had me hooked. 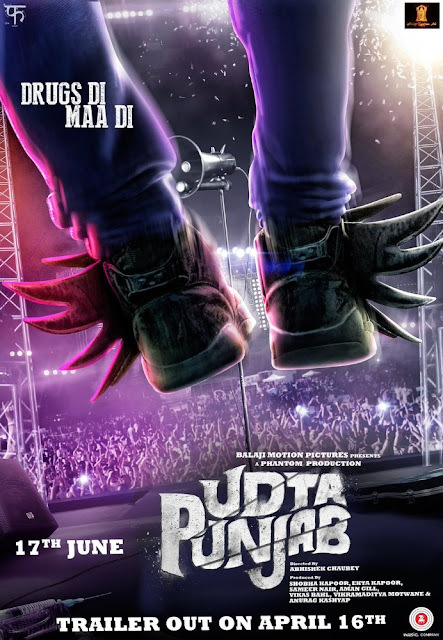 Between the first few minutes, the last half hour, and the set-up leading to the timely revelation of ‘Ik Kudi’, ‘Udta Punjab’ has plenty going for it. It’s the middle, however, that could have done with some trimming. We spend a little too much time with Tommy, yet don’t get to see that many shades of him. Shahid does a good job with the over the top portrayal of Tommy, but it ends up feeling a little bit single track after a while. His moment of epiphany seems to arrive when he’s in the lock-up, but doesn’t. It rears its head again when he shoots at his uncle, but that’s another false alarm. During the show where he finally loses it, you give him another chance, only to be treated to more of the same. By the time he gets inspired by Mary Jane rescuing him, you’re watching & interested mostly because Alia is involved. Ironically, Preet (Kareena) & Sartaj’s (Diljeet) track is one that could have used more time & depth. Their investigation seems one-dimensional, and things proceed all too conveniently. It doesn’t seem to belong to the same movie where Alia’a character is having such a rough time. Dr Preet is the one character in this mix with no blemish, and I feel depth in her arc was sacrificed in the interest of keeping her pure and dignified, well above all the muck she's surrounded with. This enhances the shock you feel at her ultimate fate, but it’s too little too late by then. Sartaj was interesting to me. He’s simple but not stupid, and it takes some doing to not resort to caricaturing. To Diljeet’s credit, he doesn’t miss a step. I’ll definitely be looking out for more of his work. A lot of credit is due to the director Abhishek Chaubey for making a movie about Punjab with authentic Punjabi character, and not once resorting to Balle Balle Shava Shava, Aahu Aahu, or Harippa! The songs take on a whole new meaning once you’ve seen the movie, and I was really thankful for subtitles when the songs were on. The subtitles made me wish I knew Punjabi to catch what was lost in translation. This was a good movie, and a lot of the nitpicking here is due to the fact that I expect more from this cast and crew. They've set me up to do so. It's on Netflix now, do watch.